The Japanese Aerospace Exploration Agency HTV-6 cargo ship arrived at the International Space Station on Dec. 13, 2016 and is seen here at the end of the station's robotic arm after its successful capture. It may not be a sleigh driven by a jolly old elf, but a Japanese cargo ship arrived at the International Space Station today (Dec. 13) to make a Christmas delivery to the outpost's six-person crew. The Japanese Aerospace Exploration Agency's robotic H-II Transfer Vehicle 6, or HTV-6, was captured by station astronauts using a robotic arm at 5:37 a.m. EST (1037 GMT). A few hours later, the cargo ship and its nearly 5 tons of supplies were attached to a berthing spot for unloading later. It is JAXA's sixth unmanned cargo delivery to the station using its HTV Kounotori vehicles (the name means "white stork"). Kimbrough and French astronaut Thomas Pesquet of the European Space Agency used the station's robotic arm to latch onto the HTV-6 as it and the space station sailed 250 miles (402 kilometers) over southern Chile. Flight controllers at NASA's mission control center in Houston then took remote control of the arm, guiding HTV-6 to its parking spot at an Earth-facing port on the station's Harmony module. JAXA's HTV-6 launched into space on Dec. 9 and is filled with water, spare parts and other supplies — perhaps even some Christmas gifts — for the six Expedition 50 astronauts currently living on the space station. The crew includes two Americans, one French astronaut and three Russian cosmonauts. "We look forward to all those vehicles arriving and us then grabbing most of those, taking them on the space station, and it's kind of like Christmas every time one shows up, because there's a bunch of fresh food and new clothes and new equipment for us to work on," Kimbrough said in a press conference earlier this year before launching to the station in October. Also packed amid the tons of cargo are six new lithium-ion batteries that will be used to replace older nickel-hydrogen batteries in the station's solar arrays during spacewalks next month, NASA officials said. HTV-6 is also delivering the fifth small Technology Education nanosatellite (TechEdSat-5), which will perform a novel ExoBrake spacecraft re-entry technology demonstrator in early 2017. ExoBrake is a "tension-based, flexible braking device that could help bring small payloads back through Earth’s atmosphere unharmed, accurately de-orbiting through a series of adjustments to modulate drag," NASA officials said in a statement. 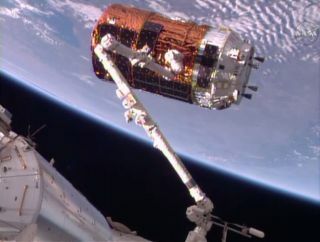 Japan's HTV spacecraft are disposable vehicles that form part of the international fleet of robotic cargo ships that periodically resupply the International Space Station. Tuesday's successful docking comes 12 days after the failure of a Russian Progress cargo ship during its Dec. 1 launch. Two U.S. companies also resupply the space station; Orbital ATK recently delivered tons of supplies to the outpost in October using its unmanned Cygnus spacecraft. Meanwhile, the company SpaceX — which typically delivers cargo using robotic versions of its Dragon space capsule — is working to recover from a Sept. 1 launchpad explosion that destroyed a Falcon 9 rocket and commercial satellite payload. SpaceX plans to resume Falcon 9 rocket flights in January. HTV-6 will stay linked with the International Space Station for about five weeks. At the end of that time, it will be packed with trash and unneeded items and released to burn up in Earth's atmosphere.